Q. What is the American Council of the Blind? A. The American Council of the Blind (ACB) is a national organization of blind, visually impaired and sighted individuals whose purpose is to work toward independence, security, equality of opportunity, and improved quality of life for all blind and visually impaired people. ACB programs and services include "The ACB Braille Forum," a bi-monthly publication, numerous scholarship awards; ACB's annual convention; the Audio Description Project; ACB Radio; ACB's national information hotline; program consultation; membership services; public awareness; outreach to disability, businesses and government agencies to collaborate on programs and activities to benefit the blindness community; and active participation in the national legislative and advocacy scene. ACB is also a valuable resource for information on programs and services in the blindness field and laws affecting blind people. Q. What are the core principles that guide the American Council of the Blind? A. The American Council of the Blind is guided by the conviction that people who are blind and visually impaired are fully capable of representing their own situations and needs; that ACB membership is not restricted in any way and, in fact, welcomes diversity; that the organization must be governed by democratic principles which guarantee opportunities for the expression of divergent views; and that the primary task of the organization shall be to represent the needs of blind people of all ages and advocate for the resolution of problem situations. ACB upholds these core values through open elections, term limits, diverse affiliated organizations and a "living and growing" constitution and governance structure. The greatest value of ACB is our belief in, and support for every member as a contributor to the well being of all blind people. Q. Who are the members of the ACB? A. Members of the American Council of the Blind have paid dues in an ACB state affiliate or special-interest organization or are members-at-large. Citizens and/or residents of the United States and interested people in other countries are welcome. Some people acquire life memberships on their own, or are honored with a gift life membership by a family member, friend or appreciative organization. Q. What are the core differences between the American Council of the Blind and other organizations of and for the blind? A. There is an inherent distinction between organizations "of the blind" and those "for the blind." Organizations "of the blind," like the American Council of the Blind, are governed both literally and through core principles by blind and visually impaired people. ACB believes that a consumer-driven organization can more effectively advocate on all aspects of service, accessibility issues, and concerns of daily living for people who are blind or visually impaired. We do, however, respect the fact that each of these types of organizations has its own place and advances its own set of beliefs and activities for its members. Q. What key policies does ACB support that contribute to the betterment of the lives of blind men and women in the United States? A. ACB is committed in its support of specialized services and programs for blind and visually impaired people, and to those agencies whose workers are trained to meet the specific needs of this population. Experience has shown that organizations having a generic approach to the needs of the disability community do not meet the needs of people who are blind or visually impaired. ACB is actively involved with access issues concerning environmental and architectural barriers, the availability of materials in braille and large print, and developments in technology on all levels. While continuing to insist on separate agencies and services for the blind, ACB works collaboratively with organizations dealing with civil rights issues for people with disabilities. Because of its increased interest in national and international sports and recreation, ACB is increasing opportunities for the blindness community throughout the United States. Q. What role does the American Council of the Blind play in international organizations of and for the blind? A. The American Council of the blind provides technical assistance, consultation, and materials to blindness-related organizations throughout the world. Through its membership in the World Blind Union and international guests at annual conventions, ACB promotes the exchange of ideas, support and problem-solving techniques to benefit blind and visually impaired citizens around the world. Q. How does ACB assist blind and visually impaired people to advocate for appropriate programs and services? A. Through its program of public education and information and referral, ACB works tirelessly to educate the public and to inform blind and visually impaired people of their right to quality service delivery. 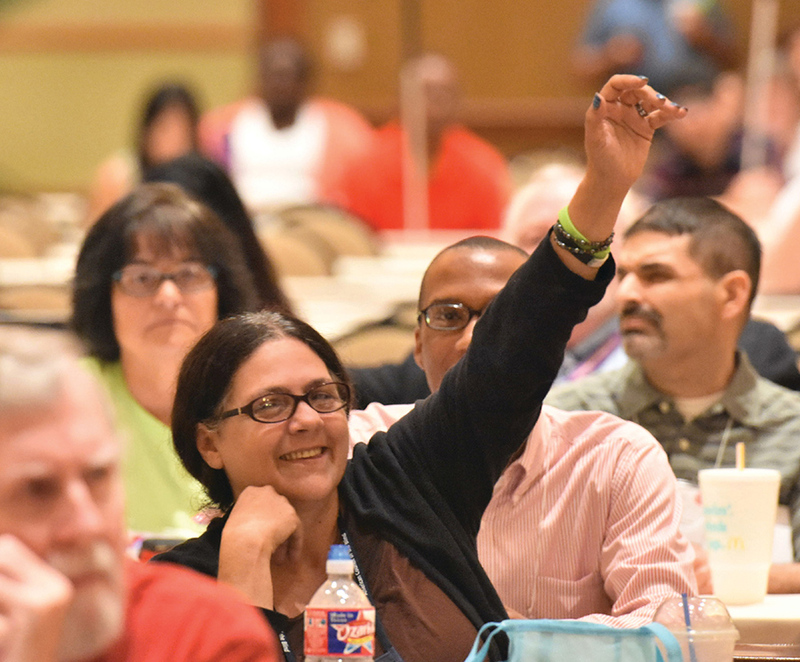 ACB staff and elected officials make countless presentations every year to inform and train members, blind people in general, and other interested parties as to the most effective strategies to advocate for quality programs and services for the blindness community. In addition, ACB holds an annual legislative seminar in Washington, DC, to educate and train members on pending key legislative issues, and provide them with the tools necessary to speak knowledgeably during visits to Capitol Hill. ACB also sponsors "ACB Reports," a monthly news magazine program, which is heard over more than one hundred local radio reading services across the United States. The Council's Washington Connection service, which is available evenings and weekends by calling 1-800-424-8666, disseminates timely, useful and relevant information on issues of interest to the blind community. This valuable information equips ACB members and friends, whether blind or sighted, to effectively advocate for appropriate, high quality services and programs for all blind and visually impaired people. Q. Does the American Council of the Blind hold an annual convention? A. In July each year, the ACB holds its annual convention lasting seven days. The convention and membership are the ultimate authority in policy-making for the Council; and serious issues are thoroughly explained and discussed, so that the membership can determine ACB's position on a given issue. Because of its diverse membership and democratic style of government, people involved in ACB can expect to hear from all sides of issues facing blind people today. Officers, directors, and committee members are elected through a spirited convention process or appointed based on their strengths for the organization and the diversity they represent rather than on their strict adherence to a philosophical principle. Term limits ensure that a variety of people will serve the organization in local, state, and national offices. Most ACB special interest affiliates meet during the convention, and there is a very extensive exhibit hall containing a wide variety of items used by the blind and visually impaired in daily living activities, recreational pursuits, and every aspect of technology. Tours to places of particular interest to conventioneers; all kinds of entertainment and social events; and a banquet to celebrate the convention experience, all contribute to the variety of information and pleasure offered by the annual convention. Q. What is ACB's position on jobs and full employment for blind Americans? A. ACB is dedicated to the ideal that blind and visually impaired people are vital, contributing members of the work force having the right to work and to receive the training and equipment to support gainful employment. Advocates from our national office, state and local chapters, and special-interest affiliates serve on numerous federal, state and local task forces to ensure that the rights and needs of blind and visually impaired people are represented as new work force initiatives are developed. The ACB Job Bank, located on this web site, is a source for current job postings in a wide variety of fields. State and local ACB chapters also feature employment-related sessions at their conventions, including job fairs, help in resume writing, training in computer skills, and workshops on body image and interviewing strategies. ACB also offers a summer internship program for students, giving them invaluable experience in the work world while providing them with exposure to role models who are blind or visually impaired. Q. What is ACB's position regarding adapting the environment to make it more accessible to blind and visually impaired people? A. ACB has demonstrated time and time again "What's good for blind people in environmental design is good for everyone!" Through its Environmental Access and Information Access Committees, ACB tackles all aspects of access to the built and informational environments. Issues facing blind and visually impaired people today that may impede access to the built environment include intersection design, transportation facility design, signage, and personnel training. The informational environment holds its own challenges, such as access to electronic appliance touch pads, telecommunications equipment such as caller ID, universal remote control devices and the Internet. ACB's access committees work with the Access Board and other federal agencies, as well as nationally known companies such as Microsoft, General Electric and AT&T, to ensure access for blind and visually impaired people. Such access will benefit all Americans as our population ages and our needs in technology evolve. Q. What position does ACB take regarding the inclusion of people with other disabilities in its advocacy efforts? A. ACB advocates for full participation of all people with disabilities in society, though the organization does place greater emphasis on the specific issues faced by people who are blind and visually impaired. A proud history of coalition work has greatly benefitted the ACB, with our most significant joint victory being the passage of the Americans with Disabilities Act. Many ACB members have been or are currently working in the cross-disability fields of independent living, vocational rehabilitation and governmental advocacy. Q. What is ACB's history regarding the Americans with Disabilities Act? A. The American Council of the Blind was a supporter of the Americans with Disabilities Act from the time it first appeared as a concept in a report titled "Toward Independence," published by the National Council on Disability. When the first version of the ADA was introduced in the late 1980s, contacts were made by ACB through its leadership in various states encouraging individuals to testify at nationwide hearings conducted by the Task Force on Rights of Disabled People, headed by Justin Dart. This official congressional entity gathered evidence to substantiate the need for the Americans with Disabilities Act. When the second version of the ADA was introduced in 1989, the ACB joined with many cross-disability groups in providing input on provisions of the legislation prior to its introduction, and testified before various congressional committees during the struggle for its passage. Many ACB leaders had the privilege of being present at White House ceremonies on July 26, 1990, when President George Bush signed the ADA into law. Q. What role does ACB play in coalition organizations with non-disability and gender-based minority groups? A. Recognizing that blind and visually impaired people belong to a larger community, ACB readily acknowledges that involvement in the issues and concerns of that community is crucial. ACB's Women's Concerns and Multicultural committees are composed of members who participate actively in non-disability, gender-based minority organizations. 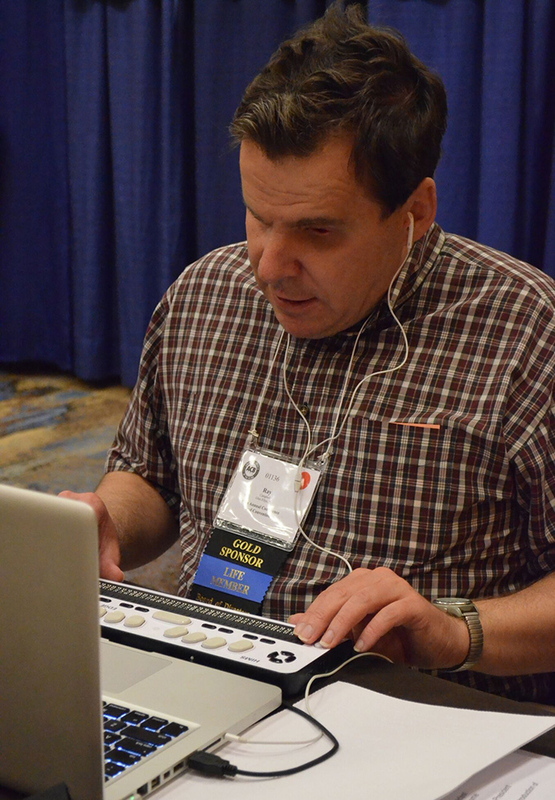 Through articles in “The ACB Braille Forum” and programs presented at the national convention, these committees bring to the general membership matters of importance to these groups. Q. What is ACB's history and philosophy regarding militancy and non-violent protest? A. Though preferring negotiation, persuasion, and consensus-building to resolve problems, members of the American Council of the Blind have participated in demonstrations, marches, and other public acts when this kind of response is appropriate to attract the attention of the press to an issue which requires additional explanation and clarification. Sometimes these strategies offer the only way of educating the public and producing the needed response. In the past, ACB has joined its efforts with those of other organizations on civil rights issues, most notably when its representatives participated in the Solidarity March for labor and the national march in support of the Equal Rights Amendment for women. When the ADA was being considered, ACB members and staff marched down Pennsylvania Avenue with others from the disability community. During the 1993 ACB convention in San Francisco, a bus filled with members went to the federal transportation building to seek press attention and policy change by the Department of Transportation to move immediately to adopt detectable warning requirements for the edges of train and subway platforms, since a number of blind people had been killed by falling from such platforms. Most recently, ACB members participated in a demonstration at the Roosevelt Memorial to urge that FDR be depicted in his wheelchair, and that the various problems with braille access at the memorial be addressed. Q. What has ACB done to enhance the role of assistive technology in the lives of blind and visually impaired people? A. Members of the American Council of the Blind have tirelessly worked with state and federal officials and with private industry to enhance the use of assistive technology, both in school and on the job, for blind and visually impaired people. The Council's representatives have served on various committees and task forces in an attempt to assist software and hardware developers in the design of standards and products that make assistive technology more accessible on a broader scale. ACB works closely with other blindness-related organizations to educate both government and the private sector regarding the potential for education and employment that exist for blind and visually impaired people who have access to proper training and assistive technology. When necessary, ACB has further followed legal process to insure that blind people have access to, and the use of, assistive technology. Q. How can I join or volunteer to work with ACB? A. ACB is in the business of building a better future for all blind and visually impaired people. Your involvement can help to succeed in this goal, your commitment can add to the richness of our community and your wisdom will reach its potential when shared with an organization that listens. Please contact the ACB national office at 1-800-424-8666 or via e-mail, info@acb.org. We look forward to involving you in one of the most rewarding experiences of your life. If you have additional questions, please call the American Council of the Blind at 1-800-424-8666 or leave an e-mail message at info@acb.org for further follow-up. Thank you for your interest in the American Council of the Blind.